Now starts the days of having them both home all day and feeding their "hollow legs." At least that's how it is in E's case. 13 years old, almost 6 feet 3 inches tall, and ALL boy. He is growing like a weed! Should be interesting keeping him fed all summer long. Boy my grocery bill is going to huge! HA! E loves s'mores, and so do K and I, but E is the traditionalist of the family. Likes every plain and simple, nothing special, no deviating from the original. K and I, we like to mix things up a bit. 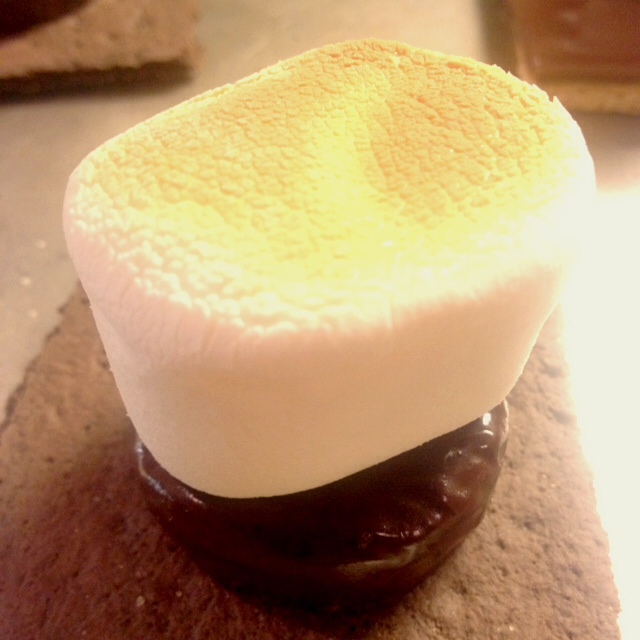 So I came up with a new s'mores combo, just for the two of us. Preheat the broiler on your oven to Low and set aside a small sheet pan. Take four of the graham cracker squares and add a peppermint candy, then a marshmallow, on top of each square. Set all four cracker squares on the sheet pan. Take the other four graham cracker squares and set them aside. Place your oven rack about 6-8 inches under the broiler. Place the sheet pan on the rack under the broiler, allowing the marshmallows to get soft and toasted and the peppermint candy to slightly melt, about 3 minutes. Oven temps vary so be careful with this step! If you leave them in too long the marshmallows could burn. Once the marshmallows have reached your desired doneness, remove the sheet pan from the oven. Immediately place the other graham cracker square on top.